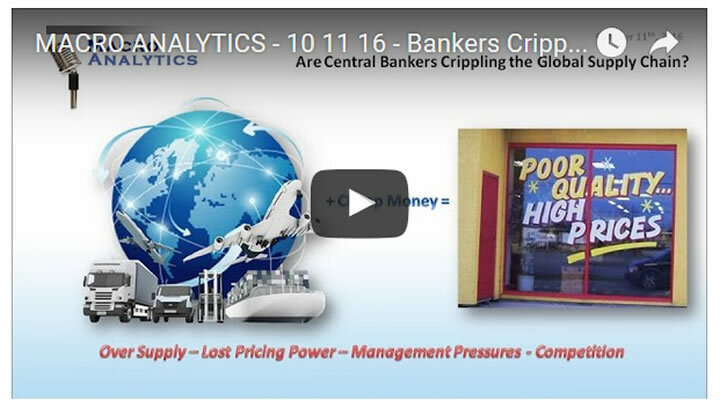 Are Central Bankers Crippling The Global Supply Chain? Gordon T Long and Charles Hugh Smith begin 'pealing the onion' on a deteriorating global supply chain and what the root cause is. Though the Samsung Galaxy Note 7 battery problem is presently receiving a tremendous amount of media and public attention, what few appreciate is that it is only the tip of the iceberg of cracks in the global supply chained as a result of unintended consequences of central bank monetary policies. In this 35 minute video Gordon T Long and Charles Hugh Smith begin 'pealing the onion' on a deteriorating global supply chain and what the root cause is. Economists have been preoccupied since the 2008 Financial Crisis with stimulating economic growth through policies which attempt to create Demand. It is debatable whether these Keynesian stimulus programs have succeeded, but what isn't debatable is that cheap money has exploded global supply! Though Corporate Profits are presently at all time highs, revenue growth and margins are rolling over and cashflows are falling. This has been placing incredible pressures through out the global supply chain. 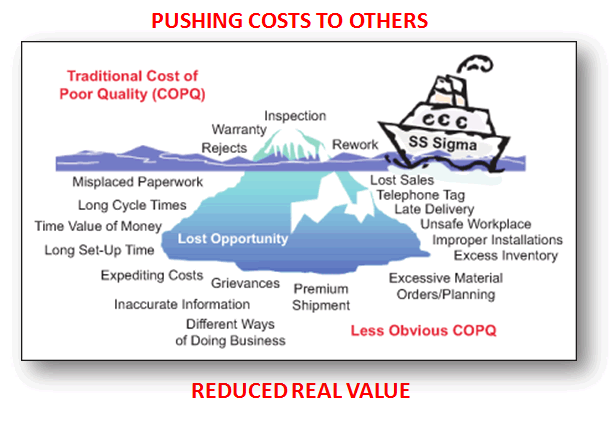 It is resulting in deteriorating product quality when considered in light of total cost of ownership and whether the customer is actually getting more for less or whether they are now receiving less for more! The pressures big distribution players like Wal-Mart are placing on global product suppliers is well recognized. What is less recognized is how internal cultures are changing due to increasing pressures and demands. This issue has received the glare of the public spotlight through the deviant behavior of Wells Fargo. What we witnessed during testimony before congress because of the fraudulent creation of thousands of fictional accounts and the resulting firing of thousands of apparent guilty parties is that the top down pressures by executives to meet unrealistic goals is causing workers at all levels to "cheat"! Senior executives are fired for not meeting quarterly financial goals even if the economy is slowing and profits are at historic levels. Something has to give somewhere and that "give" is occurring in the hidden bowels of product quality. The conclusion is that this is only the initial waves of more to come. In a conversation Gordon had with the head of Global Supply Chain for a major corporation he was told that focus had been taken off this critical area over the last few years but was now being urgently attended to. Samsung has added additional urgency as the public and regulators will be intolerant the next time such an event occurs.. 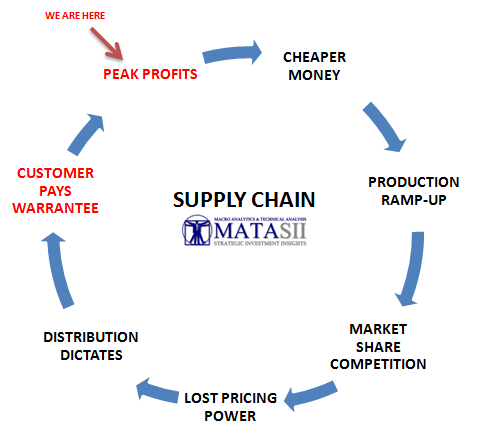 The cost of poor quality is now being pervasively felt across the entire supply chains. It beginning to reach out and impact all participants. It like a cancer which growths quietly and often it is to late when finally detected. We are Steadily Getting Less and Less for More and More! Request your FREE TWO MONTH TRIAL subscription of the Market Analytics and Technical Analysis (MATA) Report. No Obligations. No Credit Card. Gordon T Long is not a registered advisor and does not give investment advice. His comments are an expression of opinion only and should not be construed in any manner whatsoever as recommendations to buy or sell a stock, option, future, bond, commodity or any other financial instrument at any time. While he believes his statements to be true, they always depend on the reliability of his own credible sources. Of course, he recommends that you consult with a qualified investment advisor, one licensed by appropriate regulatory agencies in your legal jurisdiction, before making any investment decisions, and barring that you are encouraged to confirm the facts on your own before making important investment commitments. © Copyright 2013 Gordon T Long. The information herein was obtained from sources which Mr. Long believes reliable, but he does not guarantee its accuracy. None of the information, advertisements, website links, or any opinions expressed constitutes a solicitation of the purchase or sale of any securities or commodities. Please note that Mr. Long may already have invested or may from time to time invest in securities that are recommended or otherwise covered on this website. Mr. Long does not intend to disclose the extent of any current holdings or future transactions with respect to any particular security. You should consider this possibility before investing in any security based upon statements and information contained in any report, post, comment or suggestions you receive from him.